Is Your Current Vacuum Making Your Family Sick? If someone in your home has asthma, allergies, bronchitis, chronic lung disease or heart problems, the answer might shock you. According to the newest studies from the Environmental Protection Agency, there’s a killer on the loose preying on the most fragile among us: children and adults with chronic health conditions. This threat has been identified as one of the top five environmental health risks in the U.S., and it kills 1,000 Americans each week. This silent killer trapped in your carpet causes Indoor Air Pollution, and the way you clean your home may actually be aggravating your family’s cardiopulmonary problems and increasing the chance that you or someone you love might need E.R care or hospitalization. If you use a bagless vacuum (such as a Dyson), or a substandard bag-type vacuum, you’re putting your family at risk. Every time you use an inadequate vacuum, you could be releasing pollutants such as fine particles of pet dander, dust mite feces, even dust from your home computer printer back into your home. Plus something extra–emissions of potentially deadly fine lung-damaging particles from the wear of your vacuum cleaner’s carbon brush in the motor. Vacuuming with a machine that has an inadequate filtration system could wind up making your home as potentially deadly as Los Angeles on a polluted day according to studies released at a major scientific conference sponsored by the EPA: “PM2.5: A Fine Particle Standard Conference,” January 28-30 in Long Beach, California. Operating inside every SEBO Vacuum is an S-Class Filter System which brings Hospital-grade filtration into your home, eliminating the risk of potentially damaging particles from filling the air with each cleaning. Each vacuum utilizes a 3-layer filter dust bag which include caps to ensure complete confinement of all material. Top-fill bags mean dirt collects at the bottom and accumulates upward without recirculating which allows greater air flow. A state-of-the-art electrostatic microfilter captures micro-fine dust particles from the bag airflow absorbing greater than 99.9% of particulates down to 0.3 microns. A relatively open texture allows smoother airflow for undiminished suction performance and a longer life. The third stage of SEBO filtration is an exhaust filter which further refines all air that is emitted back into your home. Surrounding all of this exceptional filtration is a patented Sealed System which has been tested under operating conditions (vs. the unreliable lab testing of standard vacuums) and is proven to provide true hospital-grade filtration, ensuring that nothing escapes through cracks or gaps in the vacuum itself. What goes in the vacuum stays in the vacuum! 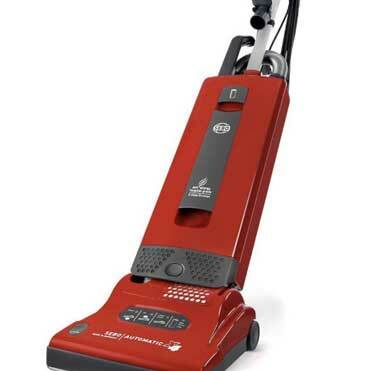 SEBO vacuums are created with housings constructed from thick, reinforced ABS Plastic—a strong, engineering-grade material designed to resist impact and look great without fading with age. All interior parts are made from aluminum and metal and include a timing-belt-driven brush with clutch protection. The wheels on every vacuum are rubber-coated, mounted on steel axles and bearings for a non-scuff, smooth rolling ride. The heart of the SEBO is its high-end quality motor built to last. Many SEBO owners testify to vacuums still going strong after 15 or more years. SEBO is so confident of the quality of their vacuums, they back them with a Free 7-Year Warranty on the motor and a 5-year warranty on non-wear parts and labor. No matter where you live, if you can’t find SEBO service nearby, you can ship it to them free for repair or replacement. The reduction of lung-damaging particles in your home begins on the surface of your floor. 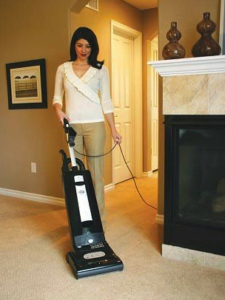 Using up to 1300 watts of power, SEBO vacuums direct powerful airflow to the floor for maximum suction. Uniquely designed brush rollers and floor tools funnel dirt, hair, and debris into the power head’s airflow channel instead of pushing it around on the floor. For hard floor vacuuming, a rubber seal strip ensures debris moves into the airflow rather than escaping from the back of the floor tool. 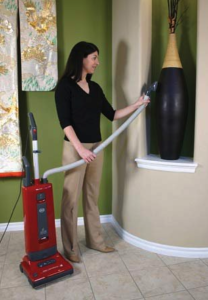 SEBO vacuums demonstrate impressive edge-cleaning, drawing in all manner of debris wedged between carpeting and baseboards, or along floor-based furniture. With such exceptional suction, you might think the dust bags must fill quickly. But SEBO multi-layer dust bags can hold from almost 1 gallon to 1.5 gallons of debris, depending on the model, much more than most residential vacuum cleaners. So, you actually change bags and filters less frequently. With 31-foot power cords and telescopic wands, SEBO vacuums can reach into every dusty corner, high or low. Their upright vacuums feature instant-use wands and suction hoses built right into the body, plus full size on-board tools for swift elimination of dirt from any surface. It’s easy to see why SEBO vacuums are noted for being the world’s best vacuum for pet owners! You might assume that these high-performance vacuums are also high-maintenance. Not so. Every SEBO is equipped with warning indicators which alert owners to full bags, brush obstructions, clogs, and incorrect brushroll height. Models with electric power heads feature automatic brush roller shut off in the case of an obstruction. These indicators help protect the vacuum’s motor and belts from overheating and undue wear and tear. In addition, a handy clog door allows owners to quickly and easily remove smaller object or matted debris. SEBO vacuums feature simple slide-in bags and filters which are available separately or in a service box which includes a supply of bags and replacement filters for each model. SEBO also offers a variety of optional accessories. A unique feature of these vacuums is that all of them share the same brushroll either in 12-inch or 15-inch widths. So, when yours (finally) becomes worn you don’t have to send out a search and rescue team to find a replacement. Just one brushroll fits all SEBO vacuums—simple! Replacing or cleaning it is super-easy as well. With the push of a button, the brushroll is released and you simply turn and pull it out of the side of the power head. Remove tangles and slide it back in, turn and lock—nothing to disassemble and wrestle back together. Don’t put the health of your family in danger by using a cut-rate vacuum. Take the advice of the EPA and invest in a machine that will keep your home and your family safe for years to come. Give Jon a call at (816) 895-7000 or just click HERE and you could be using your new SEBO by tomorrow!